Japanese Movie DP 03: "Arceus - To the Conquering of Spacetime"
American Movie 12: "Arceus and the Jewel of Life"
Satoshi and his friends head toward Michiina Town to check out its ruins. While they look around, Giratina suddenly appears! Just then, a young girl named Sheena arrives on the scene and prays for the legendary pokemon Dialga to come to her aid. Later, Sheena and her partner, Kevin, take Satoshi-tachi to a chamber where they explain the reasons for the conflict between Dialga, Palkia, and Giratina. They also bring up another pokemon, Arceus, and explain that it is a god pokemon who holds a grudge against humans because it was betrayed by a man named Damos thousands of years before. Sheena tries to quell Arceus' anger, but the pokemon decides to cast its judgment on Michiina anyway. The legendary dragon trio appear to stop it, and an all-out battle ensues! Eventually, Dialga sends Sheena and the others to the past to prevent the chain of events that angered Arceus in the first place. Once there, they discover that the betrayal was due to Damos being hypnotized by a pokemon belonging to a man named Gishin. Arceus arrives at the temple to claim its treasure, but this time, Satoshi and the others step in to stop Gishin. After a lengthy conflict, our heroes defeat Gishin and return the treasure to Arceus. They return to the present, where Arceus is still rampaging. Upon seeing Satoshi and his friends, however, it stops its attack and undoes all the destruction it had caused. Dialga, Palkia, Giratina, and Arceus all return to their respective dimensions, thanking Satoshi for all his hard work. *Whew* Trying to summarize this movie in my self-imposed word count limit is no easy task. I think that's one of the things that bugs me about this movie; it really tries to do too much. They try to give an explanation of a legend, do a bunch of time traveling and all the complications that brings, make an attempt to tie up the trilogy that started two movies ago, and throw in some HeartGold and SoulSilver advertising for good measure. It doesn't really have a chance to focus on any one thing and gives us a product that has a lot of great ideas in it but is too easily distracted to pull any of them off successfully. The alternate timeline plot, in particular, is just an absolute mess, but it's not all that surprising when you consider the franchise's other attempts at butterfly effect-type plots. Having said that, I still liked it. It's not my favorite movie, but it's not my least favorite, either. I generally liked how Arceus was portrayed in this movie, and I like how involved the side characters are with the movie's plot. Kevin is the closest to a throwaway character that we get in this movie, but even he manages to do a few things here and there. I also liked the villain in this movie, particularly how he's not really a villain at all. He's just a guy who really loves where he lives who just has a really, really weird way of showing it. I also enjoyed the Rocket-Dan parts because, even though they were pointless, they were still fun. Seeing Nyasu wearing a pot on his head, thinking it's a royal crown, is pretty hilarious. I also really dug the art style of the movie, the inventive stuff they had in the past (such as everyone calling pokemon "magical creatures"), the apathetic guard of Damos' jail cell, the fact that the Notch-Eared Pichu wasn't shoved down our throats in this movie like we had feared, Takeshi's Usokki getting a chance to shine, the ending animation, and the music. Really, the only fault I have with the film is the aforementioned time travel nonsense; everything else is great. As for the dubbed version...well, the most remarkable thing I can say about it is how quickly it came out. It aired on American TV a mere four months after it premiered in Japanese theaters, which is less time than it takes for it to be released on DVD over in Japan. Super, super weird. As far as the quality of the dub goes, it's alright save for the things I'll mention below. One thing I did like was how the dub portrayed Arceus pretty much the same way it was portrayed in the Japanese version. While whoever did its voice in the English version is no Miwa Akihiro, he still does a really good job giving the character a voice that's distinct and also very fitting. Some fans were upset that Arceus didn't have a deeper voice because they wrongly believe that it's supposed to be "God," but you can't please everyone. It's also interesting to see the differences in the way this movie was hyped in Japan compared to what was done for the U.S. In Japan, the movie came out about two months before HeartGold & SoulSilver came out, making the inclusion of the Jouto starters and the Notch-Eared Pichu make sense. You may also remember how the Notch-Eared Pichu was heavily featured in the advertisements for the movie, got its own ending theme in the TV series, and got some contest thing where you had to count how many times a Pichu logo appeared throughout the TV broadcast each week. But the dub? The Spikey-Eared Pichu isn't being hyped at all (just like the movie itself, really), and the games the movie's promoting wouldn't be coming out until almost half a year later. Dialga, Palkia, and Giratina keep their Japanese voices. The first thing I should probably mention is the way Arceus' name is pronounced in the dub. I won't go into too much detail here since I already covered this in the first episode of my podcast, but the basic gist of it all is that it's Ar-say-oos in the Japanese version and Ar-KEE-us in this movie. An e-mail from site visitor nichlok guesses that TPCI's pronunciation assumes that the word is based on archeus, a theory that actually makes quite a bit of sense to me. So, who knows? Another big thing going on with this movie is the script changing Arceus' "judgment," a word that can have some religious connotations, to "justice." Which, aside from creating some awkward lines here and there makes me wonder if the people who dubbed this movie realized that NoA calls the attack Judgment in the English versions of the games. I also wanted to point out that the games use the American spelling Judgment, not the British spelling Judgement. Like every movie since the Celebi one, this movie keeps the Japanese soundtrack intact...for the most part. In this movie, a single piece of background music got replaced for the dub. Right after the movie's title screen, we see our heroes going through the tall - I dunno, grass? - while the background music piece Travel ~ Antenna of the Heart plays. As indicated by the song's title, it's pretty much an instrumental version of the movie's ending theme, Kokoro no Antena. It's track number six on the movie's soundtrack and track number three on the High Touch! 2009 CD single. Well, like I said before, the dub replaced this piece with its own music, but it's not unprecedented. 4Kids took out the instrumental version of L-O-V-E-L-Y ~Yume Miru Lovely Boy~ from Destiny Deoxys. And, more recently, PUSA took out the acapella version of Spurt! from Pokémon Ranger and the Temple of the Sea. I guess TPCI didn't want to have the instrumental version of a theme song they're not going to use in their movie? Or maybe TPCI didn't buy the rights to Nakagawa Shouko's theme song and, likewise, couldn't use the instrumental version either? Of course, the movie's opening theme is replaced as well. The opening used for the Japanese version of this movie is High Touch! 2009, but it's replaced by the Season 12 opening theme, Battle Cry - (Stand Up!). Luckily, the extended version of the English song removes all references to the season for which it was used; can you imagine how awkward it would be if the singer kept chanting "Galactic Battles?" Takeshi refers to Dialga as "a pokemon who's called a god" (神と呼ばれしポケモン) when it first shows up in the Japanese version. He also does the same with Palkia when it first appears. The dubbed version, on the other hand, simply has him refer to the two as "legendary Pokémon." Musashi also calls the duo "pokemon who are called gods" a little later, but the dub has her call them "the Time-Space Pokémon" instead. These are pretty standard "we can't say the g-word" cover-ups the dub's been doing since forever, but I still felt like I should bring it up. When Takeshi starts flirting with Sheena, he takes Sheena's hand and talks about wanting to go out on a date with her before putting it down and accidentally picking up Gureggru's hand instead. Then, the pokemon pulls his ear performs Poison Jab and drags him away. For whatever reason, the dub cuts out the shot of Takeshi holding Sheena's hand and only leaves in the shot of him with Gureggru's hand. I can't think of any reason this would be cut, really. The dialogue doesn't really have any noticeable skips or anything during this part, so it feels like it was something that was cut by TPCI and not Cartoon Network. So what gives? Arceus: "The Jewel of Life is a part of me. It cannot...and will not break!" Originally, Arceus simply says that the Jewel of Life cannot be broken as easily as it just did. It didn't make the jewel out to be some indestructible object the way the dub does. Later, in the past, Satoshi and his friends talk with Damos in their jail cell. Damos: "So you're telling me that I betray Arceus in the future?" 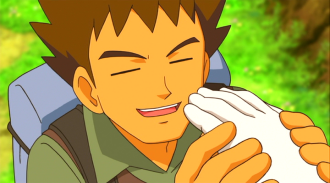 Brock: "That's what the legend says. And..."
Dawn: "...the people of Michina saw you as an evil man from then on." There's room to debate this, but Hikari's line in the Japanese version pretty much says that they (as in Satoshi and the others) thought he was a bad man, not the people of Michiina. I say that there's room for debate because Hikari's line doesn't have a clear subject, like most Japanese sentences. It's simply Anata ga ichiban warui hito to omottemashita (あなたが一番悪い人と思ってました). Hikari and the others would not have had any reason to believe that the people of Michiina thought Damos was a bad man because they never actually talked to any of the people of Michiina in modern times. Hell, we don't even know if Michiina is still populated in modern times. The only people they come across are Kako and Kanta - who don't mention Damos at all - and Sheena and Kevin. And, well, neither one of them appear to damn the guy, much less call him "an evil man." Originally, Arceus simply said "You are...," which makes it sound a lot less clueless than it does in the dub. The ending theme of the Japanese version is Kokoro no Antena (Antenna of the Heart), sung by annoying pseudo-celebrity Nakagawa Shouko. The dub replaces this with several themes, something they haven't really done since...the pre-Miramax days? I don't remember. Also, for some reason, the part of the ending that goes "Open your eyes, it's easy to do~" (right after Shaymin's scene) reminds me of a slower, more relaxed version of this song from my childhood. And now I can't get that song out of my head. Dammit. This movie turned out alright, more or less. There's the weird scene cut and some disappointing dialogue edits, as well as a variety of other weird things going on, but the English version is still passable. Especially for a dub that came out a mere four months after it debuted in Japanese theaters. As more and more of these movies come out, it's getting harder to come up with something to say about a dub that's consistently good, but not great. See you at the Zorro'ark movie!